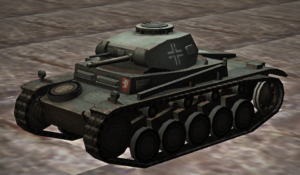 The Panzer II is the common name used for a family of German tanks used in World War II. The official German designation was Panzerkampfwagen II (abbreviated PzKpfw II). Although the vehicle had originally been designed as a stopgap while larger, more advanced tanks were developed, it nonetheless went on to play an important role in the early years of World War II, during the Polish and French campaigns. The Panzer II was the most numerous tank in the German Panzer divisions beginning with the invasion of France. It was used in both North Africa against the Western Allies and on the Eastern Front against the Soviet Union.